We had a bear wander into our local grocery store last night. 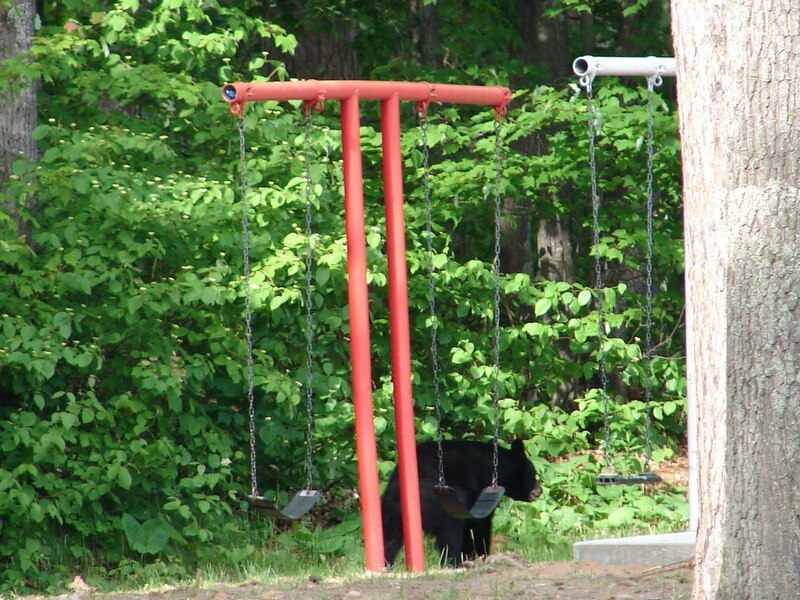 We have had bears wander through our Northwoods lawn many times. I took a picture of this bear on his foray through here last summer. This kind of thing is so frequent that we have lost our respect and fear of them to a certain extent. I took the broom after a bear a few years ago…he was walking right past our back door which I consider to be a direct affront to the safety and comfort of our home. He veered only slightly from the end of my broom and continued his ponderous career…no evidence of the attitude of fleeing that I was hoping to instill in him. All this to say that we do enjoy seeing wildlife, but I have to wonder if protecting the wild animals has been taken a little too far. The Bible refers to the wild beasts as being a curse to the land. Leviticus 26: 6, 22. Aaack!!! A bear in Marketplace?! Oh my word! I liked your other bear stories. 🙂 We used to see them alot at Deshakindawuds.